In a small bowl, combine the three spices. 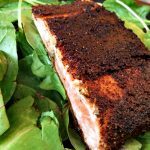 Spread spice mixture generously on the skinless side of salmon (you may not use all of the spices, but you can enjoy this mixture on just about anything – eggs, chicken, steak, etc.!). Heat cooking fat in a cast iron skillet over medium to medium-high heat. Fry salmon for 4-5 minutes on each side, starting with the skin side.